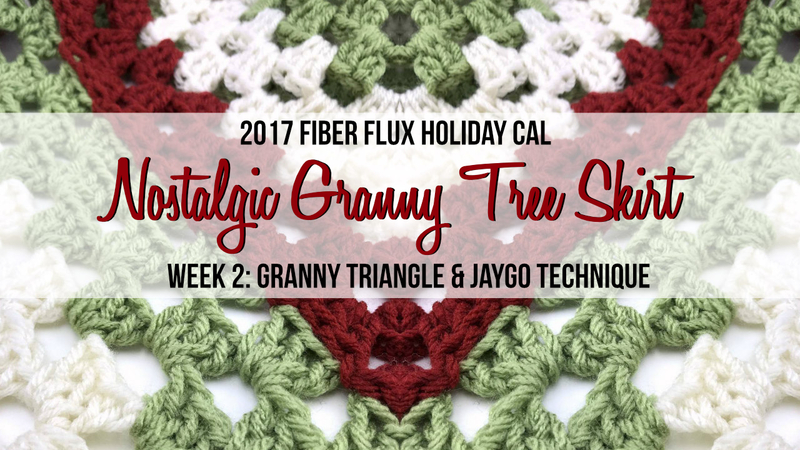 Welcome back for week 2 of the 2017 Fiber Flux Holiday Crochet Along! Today we'll be learning how to make the granny triangles and then join them all together! Ch 4 and join in the chain furthest from the hook with a slip stitch to form a ring. Round 1: Ch 6 then work 3 dc into the ring, then ch 3. Work 3 dc, ch 3 once more then work 2 dc into the center of the ring (where the ch 6 was made at the beginning of the round). 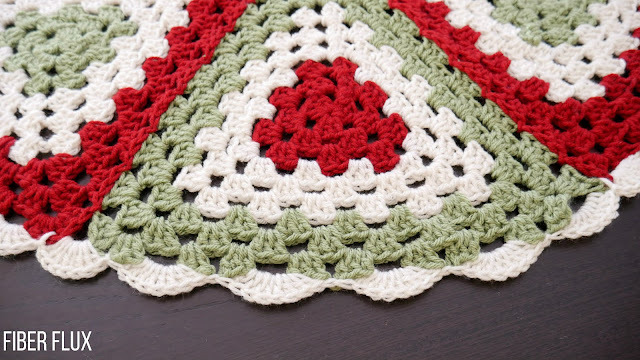 Join to close round with a slip stitch in the third chain of the beginning chain of the round. Note: The 6 chains at the beginning of the round--3 count as a dc, the other 3 count as the ch-3 space. Note: if you want to change colors, simply fasten off and tie a new color on into any corner space. To keep the same color, slip stitch over to the first corner space you come to. Round 2: Chain 6 then in the first corner space, work 3 double crochet, then chain 1. In the next corner space, work (3 dc, ch 3, 3 dc). Then ch 1 and work (3 dc, ch 3, 3 dc) in the next corner space, then ch 1. In the last corner space (same space where you began) work 2 dc, then join with a slip stitch to close round. Round 3: Chain 6 then in the first corner space, work 3 double crochet, then chain 1. Next, (3 dc, ch 1) to work the side. In the next corner space, work (3 dc, ch 3, 3 dc), then ch 1. In the next space (side) work (3 dc, ch 1). In the next corner space work (3 dc, ch 3, 3 dc) then ch 1. Next, (3 dc, ch 1) to work the side. In the last corner space (same space where you began) work 2 dc, then join with a slip stitch to close round. Round 4: Chain 6 then in the first corner space, work 3 double crochet, then chain 1. Next, (3 dc, ch 1) in the next space, then (3 dc, ch 1) to work the side. In the next corner space, work (3 dc, ch 3, 3 dc, ch 1). Next, (3 dc, ch 1) in the next space, then (3 dc, ch 1) to work the side. In the next corner space work (3 dc, ch 3, 3 dc, ch 1). Next, (3 dc, ch 1) in the next space, then (3 dc, ch 1) to work the side. In the last corner space (same space where you began) work 2 dc, then join with a slip stitch to close round. Repeat round 4 until triangle measures about 16 inches from bottom to top point, then proceed below for JAYGO (join as you go). Make a complete triangle (see above). 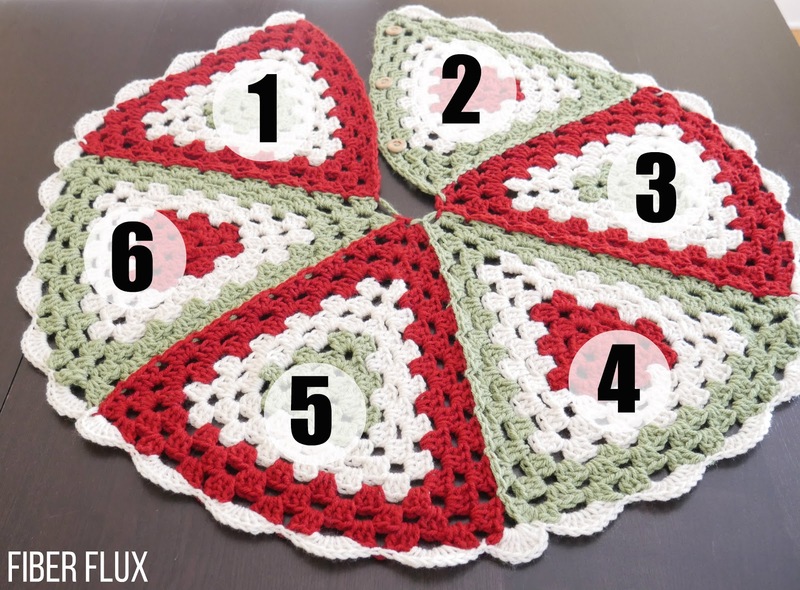 I made mine in three rounds of each color, for a total of 9 rounds per triangle. Mine measured about 16 inches from bottom to top. Make the second triangle and when you get to the very last round, work the first side as you normally would. 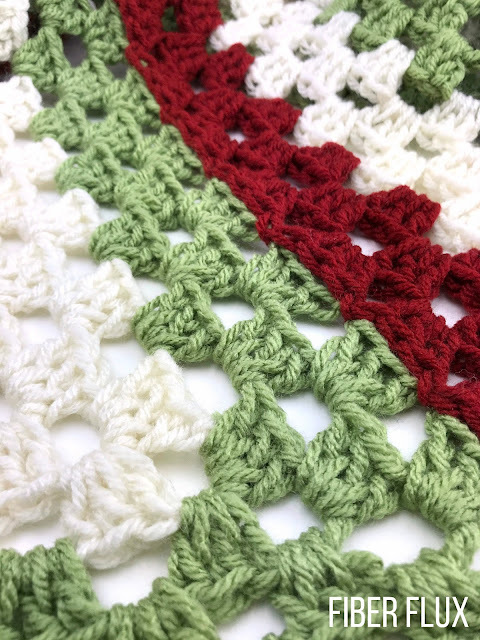 When you get to the corner space, work 3 dc into the corner space as normal, then work a slip stitch into the other triangle you are joining this one onto. Then work 3 more dc into the same corner space. Work the side of the triangle by working 3 dc into each side space and instead of the ch 1 (as was done in previous rounds) instead work a sl st into the corner spaces to join the two triangles together. At the next corner space, work the first three dc, then sl st join onto the other triangle, then 3 dc into the corner space. Continue around the rest of the triangle as normal (see above pattern). Repeat step 2 for the rest of the triangles, leaving an opening on the very last triangle (so that tree skirt can go around the tree trunk). I made and joined a total of 6 triangles for my tree skirt (see above diagram). Tuesday December 12: Edging and finish work.